When setting up a home network for Internet access, the devices involved and their function can be confusing. Modem or Router or Gateway. The names of these devices sound threateningly technical, but they are actually quite simple, and once you understand what each one does you will have a better understanding of what you need. In this article I’ll try to explain in simple words the differences between the three main devices used in home networks (and in offices as well) to provide internet connectivity to users. The word modem stands for “modulator-demodulator” and it is used mainly as the border device to connect the cable coming from the Internet Provider and translate the signals to “computer-friendly” data. In the days before broadband Internet, people used modems to connect their computer to the Internet over a telephone line. If you are old enough to remember dial-up Internet and services like AOL, you may remember having a modem connected to your computer or laptop, which you used by plugging a phone cable inside it. Fiber Optic Cable (Cable using optical light for transmission) – You will need an ONT (Optical Network Terminal) modem from the ISP. Your Internet Service Provider (ISP) will let you know what type of service you have and what type of modem you need to obtain. Though some ISPs often give you a choice of services, with varying prices for each one. You need to connect the modem to the line that comes into your home from the ISP. Usually, when you sign up for service, a technician will come to your home and set this up for you, using either a modem provided by the ISP or your own. ISPs will sometimes provide modems (and even routers and gateways) free of charge when you sign up for service, usually under the guise of a special offer. Otherwise, they will either charge you a one-time fee for the modem or let you rent it for a monthly fee (most popular in the USA). You can also buy a modem on your own, but you need to first make sure that your ISP supports this brand of modem. Usually these modems have a WAN port to connect the ISP cable and a LAN Ethernet port to connect your home computer to it. 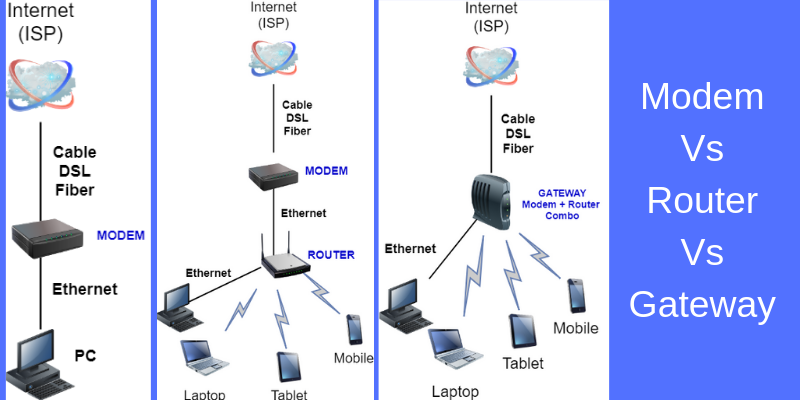 A Cable or DSL modem will typically include a single LAN Ethernet connection as described above. If all you have in your home is one computer and you do not have any wireless devices, a modem and an Ethernet cable is all you need to connect your computer to the Internet. But most people setting up a home network want to connect multiple devices to the Internet and they want to be able to connect wireless devices as well, such as smartphones and tablets. For this you need a router. 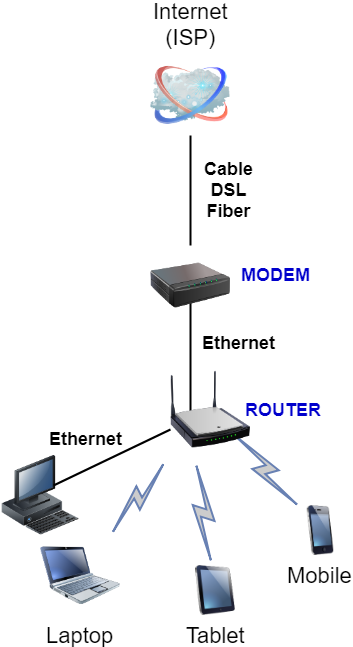 As shown from the diagram above, a router connects to your modem through its Ethernet connection with an Ethernet cable, and it lets you share your Internet service with multiple devices. You can connect these devices to the router either through further Ethernet cables as well as wirelessly. WAN port – This should be connected to the Modem. Several LAN Ethernet Ports – In order to connect wired home devices such as desktop computers, printers etc. If you have subscribed for Cable Internet or for DSL Internet service, then you MUST have a modem device in the network. The router is for allowing multiple home devices to share the internet line which comes into your modem. Like with a modem, when you sign up for Internet service, a technician can often help you set up a router that you either buy yourself or the ISP provides, either for sale or for rent (or sometimes for free). While hardwiring devices with a router is simple, setting up a router for wireless connections is a little more complicated. You need to set up an SSID and a password, usually through a web-based interface that communicates directly with the router. If your ISP cannot help you set up your router (or if such help is too expensive), you will find instructions on how to set up the router from the manufacturer, and usually it is not too difficult. Unless you live in a particularly large house, a single router is all you need to connect wireless devices throughout your home. But if your home is large and you find that wireless devices are sometimes beyond the range of the router, you need to purchase either a WiFi extender or a mesh router, which connects your devices through multiple nodes that you place throughout your home. 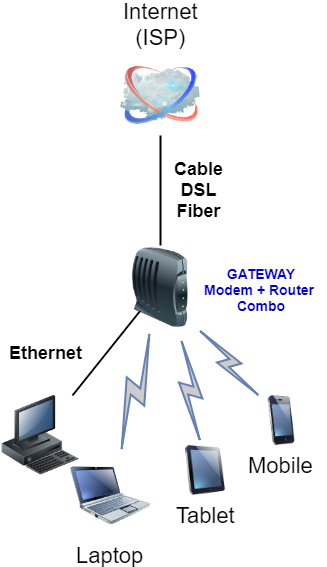 A gateway, which is also called a combo modem and router, combines the functionality of a modem and a router on the same box. Like with modems and routers, you can buy your own gateway but most of the times ISPs provide them, either for sale or for rent (or sometimes for free). At first blush, a gateway may seem like a good idea. After all, you only have to buy and set up one device. But they have a number of drawbacks. First of all, if either the modem or router breaks, you have to buy an entirely new gateway. You might also have to buy an entirely new gateway if you switch from one type of service to another. For example, from DSL to fiber optic cable. Secondly, gateways can be difficult to troubleshoot, as it can be hard to tell which part of the device is not functioning properly. Finally, while it is unlikely that you would ever want to upgrade your modem, advances to router technology are common. By buying a separate modem and router, you would only have to replace the router when upgrading. The best advantage of having a Gateway device (modem+router on the same appliance) is that you have a consolidated setup in your house with fewer cables and less devices to manage. Moreover, if you rent the Gateway from the ISP, they take care of firmware updates, hardware problems etc.